Tools: Sieve, non-stick pot, non-stick frying pan, food processor, silicone spatula, small bowl, chopping board, sharp knife, baking tray, silicone mat, mixing bowl. Notes: This recipe contains: Vitamin A, B-Vitamins, Vitamins C & E, protein, carbohydrates, fibre, calcium, iron, manganese, magnesium, phosphorus, potassium, zinc and per serving is low in added salt, sugar and saturated fats! Hi everyone! 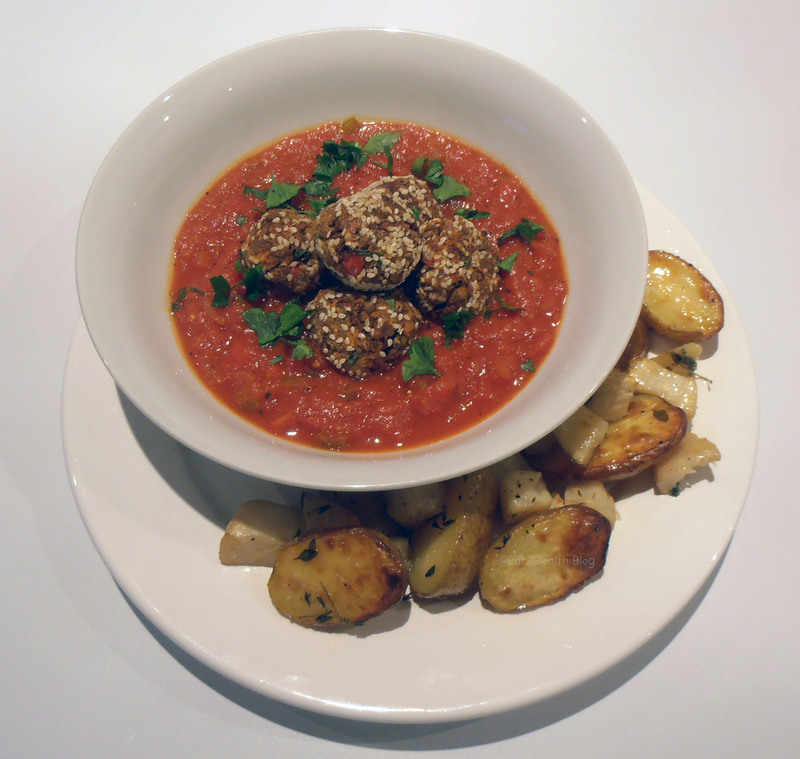 Here are some easy and delicious lentil meatballs that we made last November! So, the question is whether to use legumes or pulses?! 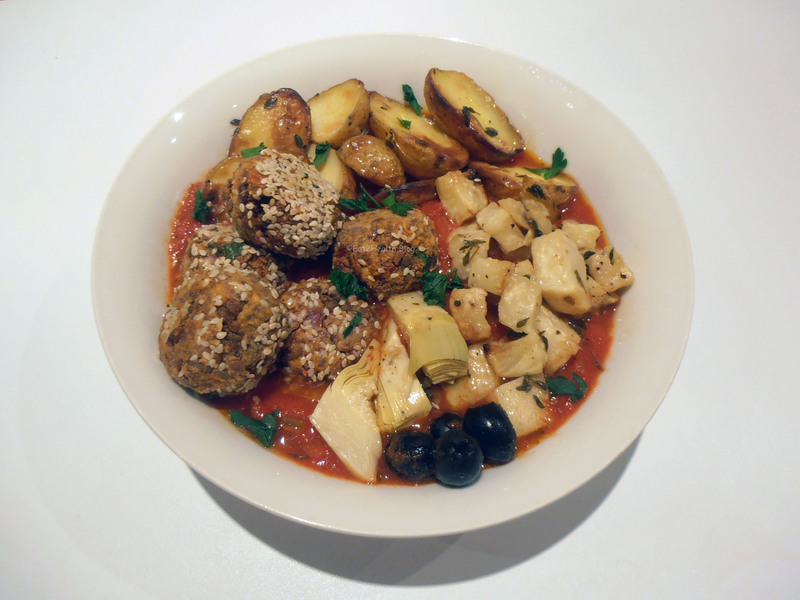 Both make great plant-based meatballs, burgers, sandwich fillings, falafels, koftes, meatloaf (more meatloaf!) and sausages (just to name a few! ); all of which are tasty, hearty and healthful in their own right. However, we are still undecided as to what we prefer! Which do you prefer lentils or beans? Overall, these little lovelies are great! The lentils, nuts and seasoning’s all provide a great meaty and savoury delight. Enjoy ‘a couple’ as a lovely savoury snack (perhaps with houmous or another tasty dip of choice?!) or as part of a healthful meal; with pasta, as a meze or in a wrap! We enjoyed ours with a homemade spicy tomato sauce and an impromptu (almost!) patatas bravas- we highly recommend it! Process or finely chop the ingredients as small as possible. Any whole lentils, or large pieces of veggies will prevent the ‘meatballs’ from forming- you’ll have to them pull out and discard the culprit ingredient(s)! We had to discard a few lentils, pieces of herbs and onion! The lentils make for a great ‘blank canvas’! Just adjust or adapt the seasonings to taste. You can opt out of cooking dry lentils and just use a tin variety instead however, as you have a few other pieces of prep to do before the actual assembly, you might as well just cook some lentils in the background. The choice is yours! Do not be tempted to ‘over bake’ them. 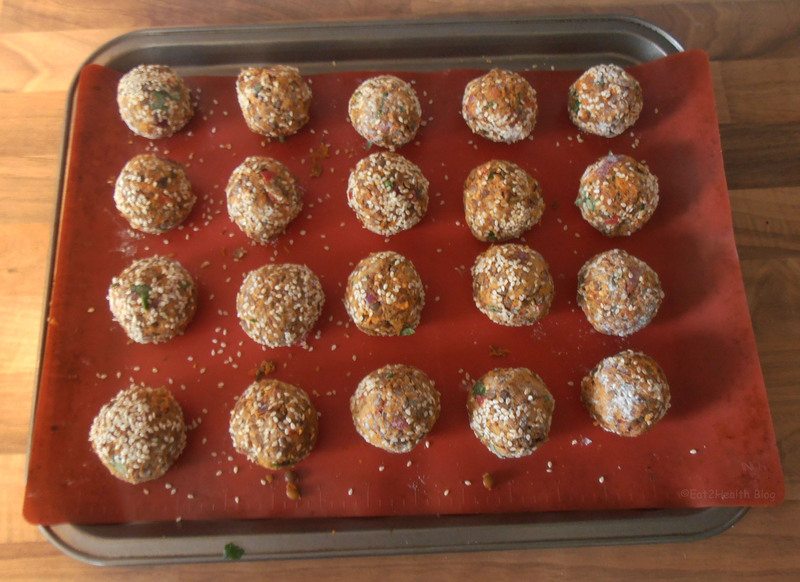 Plant-based ‘meatballs’ will be never as firm as standard ones and a dry ‘meatball’ if just not worth thinking about! Wash the lentils in a sieve, remove any seeds and stones and then cook them according to the packet instructions. In the meantime, heat a small, non-stick frying pan over a medium heat. When hot, add the walnuts and cumin seeds. Dry-fry until lightly toasted/browned. Remove from the heat and transfer into a small bowl. Allow to cool slightly. Transfer into a food processor. Process until a fine mixture is achieved. Transfer back into the bowl. If applicable, place the bread into a toaster or until a grill and toast. Remove and break it up into the food processor. Process the bread until breadcrumbs are achieved. Tip: if you do not have a food processor, toast the bread as hard as possible (without burning it) and then place it into a resealable kitchen baggie. Using a rolling pin, gently crush the bread to create your breadcrumbs! Transfer the breadcrumbs into the same bowl as the walnut mixture. Wash, remove the stem and core and then roughly chop the bell pepper. Peel and quarter the onion. Place the bell pepper and onion into the food processor. Process until minced. Tip: You could also finely chop your veggies on a standard chopping board or grate your veggies using a cheese grater! Transfer the mixture into a mixing bowl. Larger pieces will have to be chopped or discarded! Peel, trim the ends and finely grate the carrot. Wash the parsley and thyme, remove the leaves from the stems and finely chop them. Place the carrot, parsley and thyme into the mixing bowl. Drain the lentils. Allow them to cool slightly. Meanwhile, create the ‘flax eggs’. Place 16g of ground flax seed and 6 tbsp of cold water into a small dish. Mix until combined. Leave for 5 mins to set. Transfer the lentils into the food processor. Add 1 tbsp of oil. Season with a little salt and black pepper to taste. Pulse until the lentils are mostly broken down and a coarse mixture is achieved. Tip: Alternatively place the lentils into a separate mixing bowl with the oil and mash using a potato masher or large fork! Transfer the lentils into the mixing bowl. Add the breadcrumbs and walnut mixture, ¾ tsp salt, a few grinds of black pepper, 2-3g garlic salt, ½ tsp asafoetida and 2g paprika. Mix with a spatula until thoroughly combined (forming one giant ‘meatball’!). Heat the oven to 200ºC/400ºF. 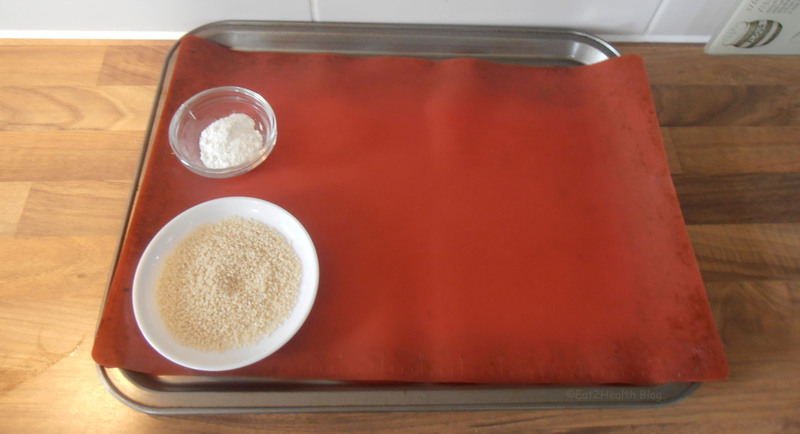 Line a baking tray with a silicone mat or some parchment paper. Lightly spray it with a little low-fat cooking oil. Set aside a small dish with 20g GF flour and another one with 12g sesame seeds. Gather some of the mixture between your hands. Tip: use a little flour to coat your hands if the mixture is a little tacky. Roll the mixture into a ‘golf ball sized’ ball. 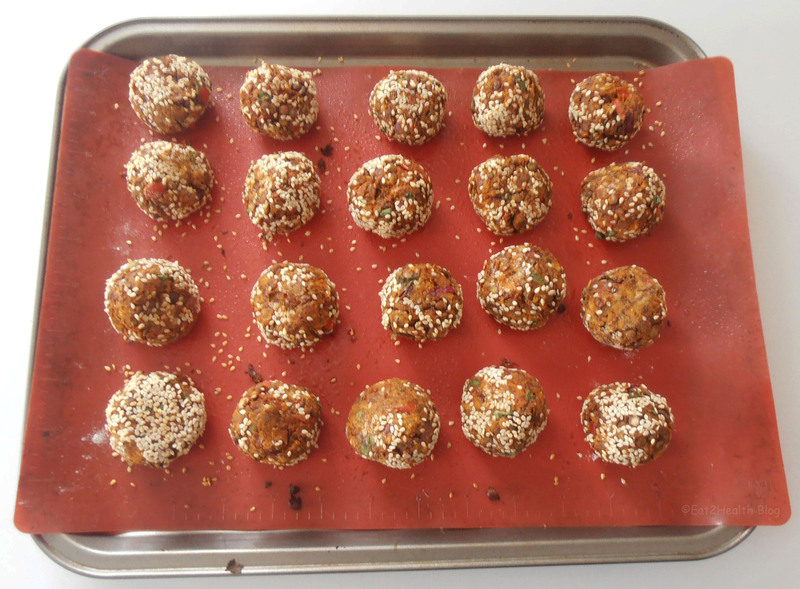 Dip and coat the ‘meatball’ into the sesame seeds. Place it onto the baking tray. Repeat until all the mixture has been used. NB: we created twenty! Place the tray onto the middle oven shelf and bake for 11 mins. Remove and carefully turn the ‘meatballs’ over. 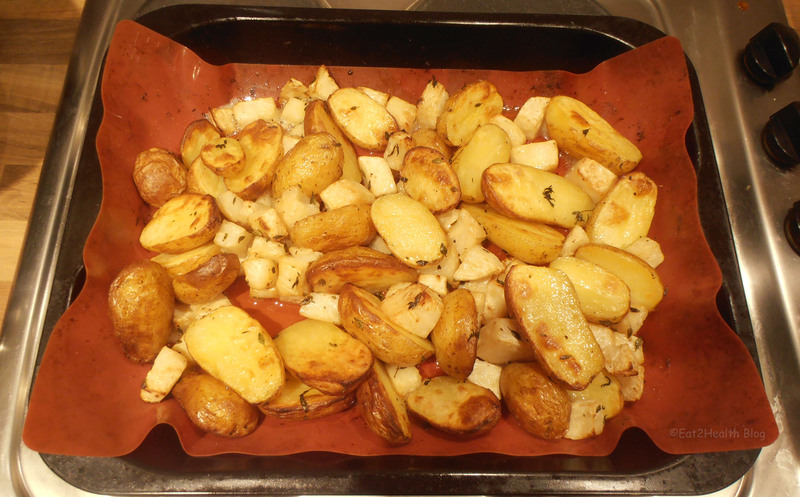 Place back into the oven and bake for a further 8 mins or until lightly browned and slightly firm. Try serving them with some roasted veggies! 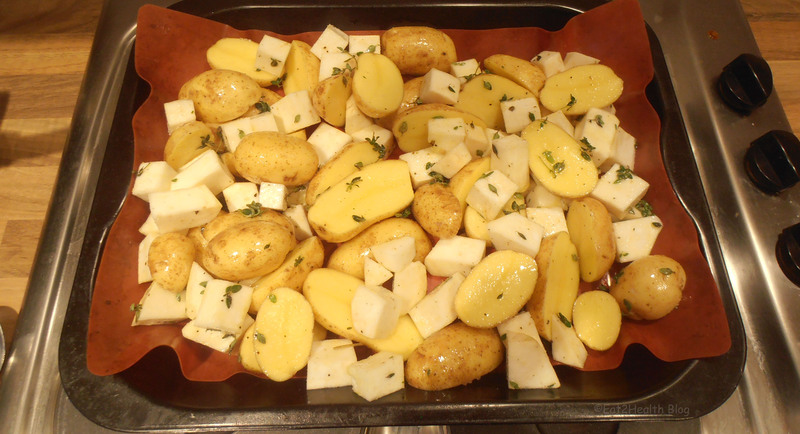 Baby new potatoes, celeriac and fresh thyme! Leftover ‘bowls’ are great too! Delicious. I like meatball dishes, especially the spicy tomato sauce. Thanks for sharing. These look delicious, especially in the spicy tomato sauce. I may have to make but with pecans as I’m allergic to walnuts. Foodies100: is the UK’s largest & most exciting network for food and drink bloggers, with almost 5,000 members! Hungry for more? Follow us On Pinterest! Meatless Monday: Seitan Doner Kebab ‘Meat’ [Vegan] Hi everyone! Happy Monday! You’ll have to excuse our lack of posts lately, there’s been a lot going on (all good) and we haven’t been keeping up to date (including getting to see what everybody else has been getting up to on here! ).